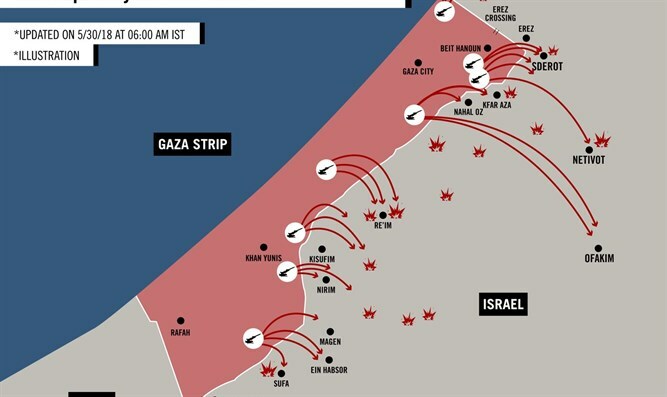 Why is Gaza erupting now, aiming rockets far from the area where it tried to kidnap soldiers and break through the fence? A significant escalation in the situation prevailing at the Israel-Gaza border took place this week. The prattle about demonstrations and attempts by "returning" Gaza residents to infiltrate Israel was replaced by missiles and mortars on a level not seen since Operation Protective Edge in 2014. Up to the time of this writing, on Wednesday morning, there have been several wounded, but no casualties, on the Israeli side. However, it is clear to all that chance alone separates a mortarshell that digs a crater on an empty street from one that hits a home or kindergarten leaving wounded and dead in its wake. The immediate question is why? Why is this erupting now? Is it a reaction to the direct hit the IDF carried out on an Islamic Jihad observation post of in Gaza, eliminating the three terrorists inside it? Or are there other factors behind this escalation? Another question is: Why are Hamas and Islamic Jihad working together on this after a long period of tension between the two? And why are they operating beyond the area near Gaza from which they tried to kidnap Israeli soldiers? For years now, Israel has been acting with a large measure of freedom against Iranian presence in Syria, bombing various targets and eliminating soldiers and officers, with Iran doing almost nothing to avenge the blood of the tens of Iranians killed in these bombings or the damage to Iranian military infrastructure in Syria. The reason Iran has not reacted to Israeli strikes is its inferior military intelligence and operational ability. Israel has inflicted serrious damage on Iran's ability to protect itself and using the new anti-aircraft systems it brought into Syria. Israel destroyed them as soon as they arrived, before they were activated and before they became operational. Israel also proved its exceptional intelligence ability, because its attacks on Iranian forces were exactly aimed and successfully pinpointed. 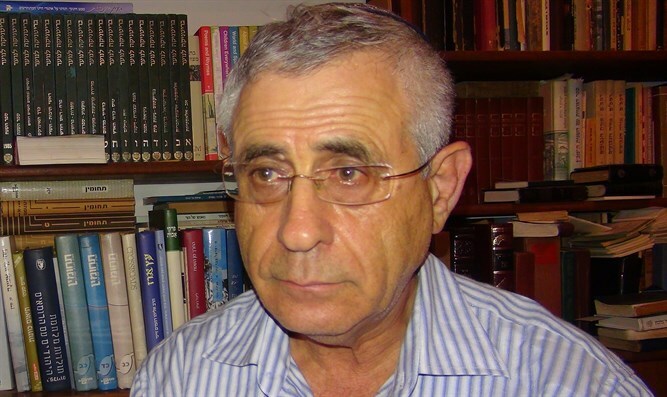 This caused the Iranian command to concentrate on its own defenses for fear that Israel would hit the Iranian commanders in Syria headed by Kassem Sulimani. Israel destroyed Iranian targets all over Syria, not just near the Golan Heights, and showed the Iranians and their Russian supporters just how much strength and resolve Israel has when it comes to attacking distant Iranian targets – hinting obliquely at Israel's ability to hit them within Iran itself. However, what really frightened the Iranians the most is the fact that Russia observed everything Israel did to the Iranian forces in Syria without lifting a finger to come to the aid of the Iranians. The Iranians could not help noticing Netanyahu arriving in Moscow every few months, sitting with Putin for hours, coming out with an almost set declaration praising the understandings between Russia and Israel and hinting that Israel has received a carte blanche from Russia, a glowing green light to act against Iran to its heart's content. The coordination between Netanyahu and Putin infuriates Iranians, as it is evidence of Russia's betrayal of Iran after Iranian soldiers' blood was spilled like water in the ground war against the anti-Assad rebels. In addition, the Iranians believe that America backs Israel in anything it has already done, is now doing and intends to do against Iran in Syria, since the US moved its embassy to Jerusalem without demanding a political quid pro quo from Israel (at least up to now) for this beneficent gesture. The Israelis succeeded in convincing the US to withdraw from the nuclear deal, and in point of fact, - at least as far as Iran is concerned - Netanyahu is Trump's advisor on the Middle East, with American policy in the Middle East relying on the experience and knowledge Israel has gathered during its 70 years in this complex region. Iran considers the Israeli Prime Minister to be responsible for Trump's withdrawal from the nuclear deal and the reestablishment of sanctions on all foreign industries and their representatives, especially European companies, which cooperate with Iran. The astute, decisive and wide-ranging use Israel evinced in integrating miitary intelligence and operational power, along with the political know-how which persuaded both Russia and the USA to back Israel's determined policies in Syria, resulted in the Iranians deciding to lower their profile, swallow their pride and humiliation, and refrain from any direct actions against Israel. The only fly in the ointment is that the Iranians have an established method of fighting their enemies – they make use of proxies. The Iranians support the Houthis in Yemen, the Hezbollah in Lebanon, Assad in Syria, loyal militias in Iraq, Hamas and Islamic Jihad on the Palestinian front, with all of them doing the dirty work for Iran in fighting the costly war against the Ayatollahs' foes. Iran supplies these terrorists with weapons, supplies, trains and funds them, expecting them to reciprocate by acting whenever requested to do so. Backstage, no one can forget the fact that Israel stole Iran's nuclear project archives, deeplty humiliating the Ayatollahs. Even worse, if the Ayatollahs did not save copies of the stolen material, their nuclear programs may have to start almost from scratch, as their scientists will have to repeat the experiments and calculations contained in the files Israel stole from under their noses. This Israeli operation revealed Iran in all its treachery. Iran's weakness increased Assad's self confidence, leading him to tell his forces to forbid Iran from storing military equipment in hangars that belong to the Syrian army, so that Israel would not attack them. The Russians are willing to create a situation that prevents the Iranians from approaching Israel, while Assad's army takes over the Syrian Golan and renews the 1974 ceasefire it signed with Israel. Iran's status in Syria is now shaky, although it shed much Iranian Quds Force blood as well as that of the Shiite militias brought from Iraq and Afghanistan, all in order to save Assad and his regime. The events in Syria over the past few weeks in which Israel saw to a stinging Iranian defeat on Syrian land, have caused the Iranians to demand that the two organizations it funds in Gaza begin to act against Israel with more than just kites, protests and snipers, instead launching rockets aimed to land past the areas in Gaza's proximity. That is why we saw rockets from Gaza aimed at Ofakim, Netivot and other areas located tens of miles from the Strip. The two Gazan organizations have their own clear and longstanding anti-Israel agenda, and if they were able to, would push the Israelis right into the sea. However, the heating up of hostilities over the past few days is clearly an Iranian initiative. The Egyptians realize this and are therefore putting much effort into ending the exchange of fire, hoping to pull the rug from under the Iranian feet trying with all their might to set Israel on fire in revenge for what Israel did to them in Syria. It must be kept in mind that Iran is saving Hezbollah for future use against Israel if a direct Iran-Israel war ever breaks out. Still, if the hostilities between Israel and Gaza develop into a dance of the danmed with tens of wounded, as in the 2014 Protective Edge. Iran might even demand that Hezbollah play a part and attack Israel from the areas Hezbollah controls In Syria, such as the Kalamoun Mountains north of Mount Hermon. In any scenario, Israel must keep its deterrent capability on high alert, reacting uncompromisingly and without mercy against any force acting against it – either through that enemy's own initiative or by means of hired mercenaries for another country. May we wish all of Israel's southern residents as well as those living in Gaza – a speedy return to calm, security and tranquility.